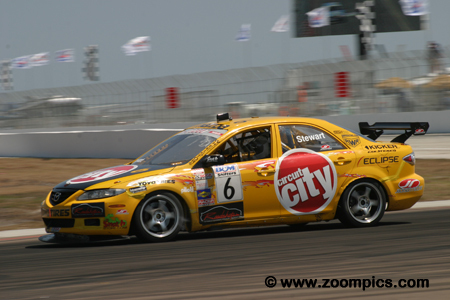 Round two of the 2006 Speed TV World Challenge Series took place at Honda Grand Prix of Saint Petersburg. Thirty-one Touring Car drivers competed in a fifty-minute race around the fourteen-turn 1.800-mile temporary street course. The pole-sitter, Randy Pobst leads the field of thirty-one Touring Cars through turn-one on the first lap at Saint Petersburg. Behind Pobst, the seventh place qualifier, Chip Herr gets sideways in the STaSIS Audi and the RealTime Acuras of Peter Cunningham and Pierre Kleinubing go wide. But the real action was behind the leaders – an accident eliminated - Eric Curran, Brian Smith, Hugh Stewart and Jim Osborn. Defending race winner, Randy Pobst drove the No. 73 Mazda 6 prepared by Tri-Point Motorsports. In the season opener at Sebring, he finished in the runner-up position - but Saint Petersburg was a different story. Pobst dominated the weekend – he was quickest in the practice sessions and qualified on the pole by 0.555-seconds. He led the race flag-to-flag and headed to Mid-Ohio with the points lead. 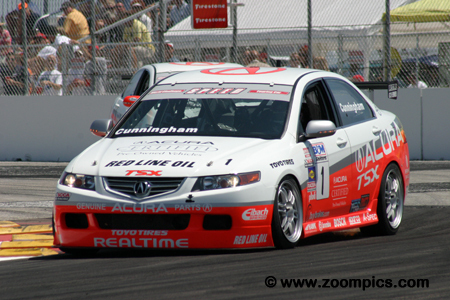 2005 Speed TV World Challenge Touring Car champion, Peter Cunningham drove the No. 1 RealTime prepared Acura TSX. Cunningham qualified third and avoided the melee on the opening lap. A poor start by his teammate, Pierre Kleinubing allowed Cunningham to grab second place. He chased Pobst, but lapped traffic prevented him from getting close enough to pass the leader. Cunningham took the runner-up spot. 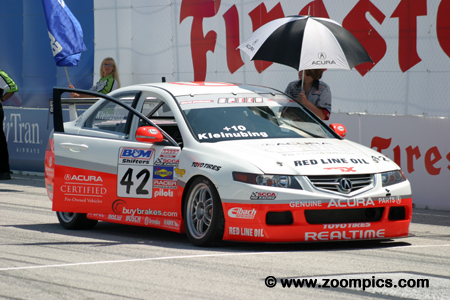 Three-time World Challenge Touring Car champion, Pierre Kleinubing drove one of the five Acuras entered by RealTime Racing. At Saint Petersburg, he was the second-fastest qualifier. A poor start caused him to lose second place to Peter Cunningham. He chased Cunningham and despite turning the fastest race lap, he was unable to make the pass. Kleinubing captured the final position on the podium. Seventh fastest qualifier, Chip Herr made a great start but almost caused a second accident on the first lap when he momentarily lost control of the No. 17 Audi A4T. Herr saved the car and fell in behind the leaders – Randy Pobst, Peter Cunningham and Pierre Kleinubing. The driver of Qvale/STaTIS Engineering was challenged by the Mazda 6 of Charles Espenlaub but prevailed and finished fourth. Charles Espenlaub was looking for redemption at Saint Petersburg. 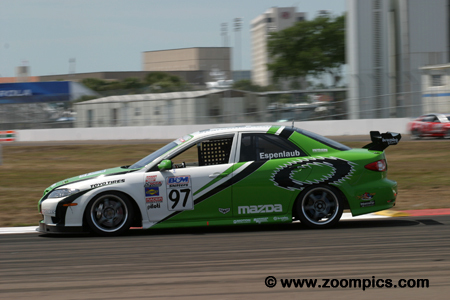 In the season opener at Sebring, Espenlaub qualified the Tindol Motorsport Mazda 6 second and finished in the top-ten but at the end of the event, he was disqualified. For round two, he qualified fourth and was involved in the starting line incident with Eric Curran. 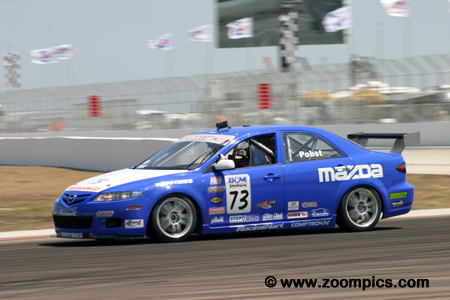 Espenlaub’s Mazda was damaged but he was able to continue and finish fifth. At Sebring, the No. 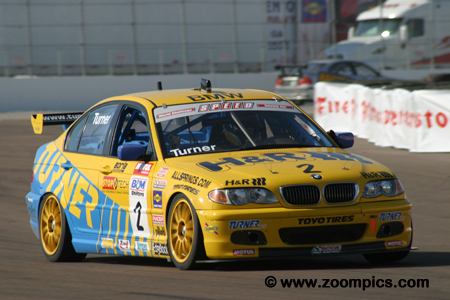 2 Turner Motorsports BMW 325i was driven by Bill Auberlen. Auberlen started and finished first in round one. Team principal, Will Turner handled the driving duties at Saint Petersburg. Turner was eighth quickest in qualifying and avoided the start line incident which claimed four cars. After almost fifty-minutes of racing, he was in sixth place. The highest finishing rookie was Jeff Courtney. 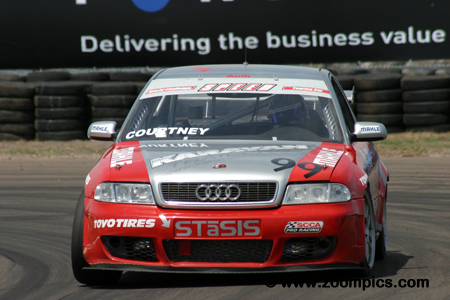 Courtney drove one of three Audi A4T entered by STaSIS Engineering. 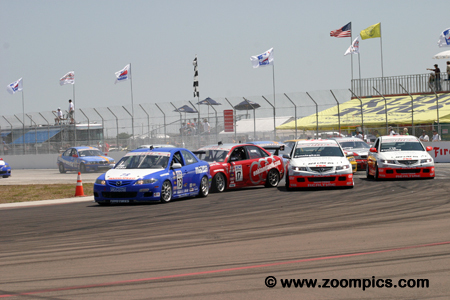 He was gridded a respectable thirteenth for the start of the race. 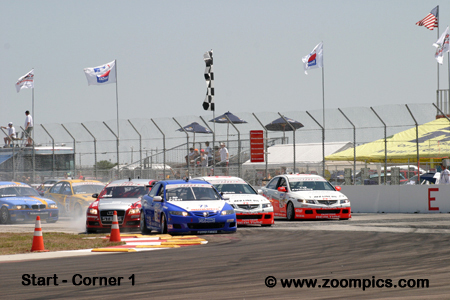 At the checkered flag, Courtney improved sixth positions and moved into the top-ten to finish in seventh place. 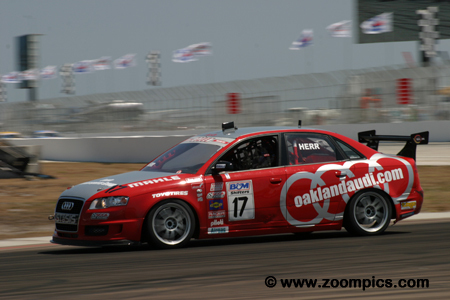 Difficulties before qualifying prevented Touring Car veteran, Lance Stewart from recording a time. Driving the Circuit City/Kicker/Eclipse sponsored Mazda 6, Stewart was gridded thirty-first in the thirty-four car field. During the race, he advanced seventeen positions and finished sixteenth. Stewart’s efforts earned him the Sunoco Hard Charger Award. Rookie, Billy Revis was not entered in round one at Sebring. The driver of the No. 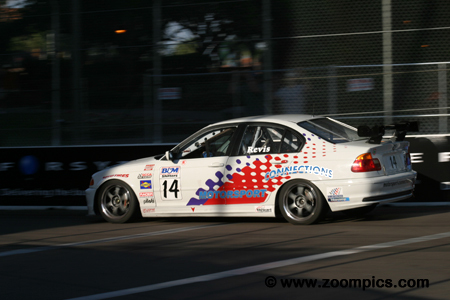 14 Motorsports Connections BMW 325 qualified thirty-first at Saint Petersburg but retired on lap-25 with a mechanical issue and was classified twenty-first. Despite this disappointing outcome, Revis won the B&M Sport Shifters Holeshot Award for advancing nine positions on the first lap.